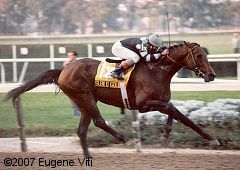 Slew o' Gold, Champion 3-year-old of 1983 and Champion Older Male of 1984, was euthanized due to the infirmities of old age on Saturday, October 14, 2007. He was pensioned in 2002 and had a variety of ailments including Cushing's disease and EPM, but was comfortable in his final years. Three Chimneys veterinarian Dr. Jim Morehead said. "Once we devised his air-conditioned stall this summer, he was quite comfortable but he was very happy last week when we finally got some cooler weather. Sandy (Hatfield, Three Chimneys stallion manager) commented that he practically dragged his groom to the paddock every morning last week. Indeed, on Sunday morning, he was jogging in his paddock. But Sunday afternoon he had a convergence of symptoms that told us his system was failing, and he was euthanized Sunday evening." Slew o' Gold was buried at Three Chimneys where he had lived for 22 years. "It's a very sad day for us," Three Chimneys owner Robert N. Clay said in a prepared statment. "He was our very first stallion, and he stood the 1985 season here all by himself. During that season, he sired an incredible four graded or group I stakes winners--an almost unheard of accomplishment. He sired six grade/group I winners in his first two crops." 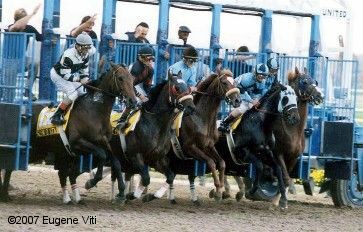 Raced for Equusequity Stable, a partnership of Dr. Jim Hill and his wife, Sally, along with Mickey and Karen Taylor, Slew o' Gold had 12 wins in 21 starts with earnings of $3,533,534. As a 3-year-old he won the Wood Memorial (G1), Woodward Stakes (G1), and Jockey Club Gold Cup (G1), while he was second in the Belmont (G1) and Travers (G1). 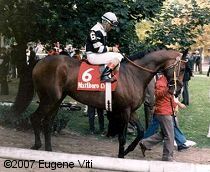 in 1984 at age 4, he won the Jockey Club Gold Cup (G1) again, the Marlboro Cup (G1), Woodward (G1) again, and the Whitney Handicap (G1) and was also second in the very first Breeders' Cup Classic (G1). While he won Champion Older Male honors for this year, he lost out on Horse of the Year to John Henry. Slew o' Gold was inducted into the Racing Hall of Fame in 1992. "Slew o' Gold was truly one of the great ones, and we will be forever grateful to the Hills and the Taylors for giving us the opportunity to stand our first stallion," Clay said. His first crop of foals in 1986 was impressive and included French Champion and English Group I winner Golden Opinion, plus Grade 1 winners Gorgeous, Awe Inspiring, Tactile. His second crop included Grade 1 winners Thirty Six Red and Dr. Root, but he failed to continue that success over time. His leading earner was 1991 colt Dramatic Gold, winner of the Meadowlands Cup (G1), Molson Million (G2), and Del Mar Breeders' Cup H. (G2), with total earnings of $2,567,630. Overall, from 17 crops Slew o' Gold sired 28 stakes winners and his progeny earned $24,642,152. "As a young horse, he was tough." Hatfield said. "He had a lot of Slew about him. But he mellowed with age, and we enjoyed each other's company a lot the last few years. We'll all miss him."